Events » REACH FM – Family FUN Day! 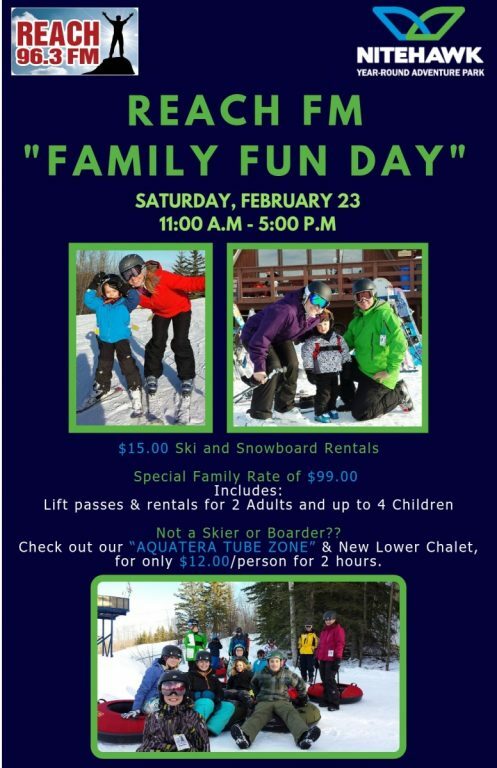 Join Nitehawk and the 96.3 Reach FM Crew and bring the whole family to Nitehawk Year-Round Adventure Park on Saturday, February 23rd from 11:00AM to 5:00PM for the “Reach FM Family Fun Day”. The #Aquatera Tube Zone will be OPEN from 1-5PM. – $15 Ski and Board rentals. If you’re not a skier or snowboarder, drop by the “AQUATERA TUBE ZONE” and stop in our new lower chalet for a warm beverage. Fun for the whole family, for only $12.00/person for 2 hours. Due to limited capacity please reserve your spot online. Because we want our guests to have the best experience possible and not to be over crowded in the Tube Zone we are currently taking reservations online by clicking the link above. Two(2) Hour Tubing Sessions are scheduled for 1:00-3:00pm & 3:00-5:00pm. Please be aware that in the event that one session is Sold Out you may be asked to wait until the next session. Thank you for your cooperation. Note: please arrive 30mins before your tubing session time to give enough time to complete waivers and purchase your helmet rental (if you don’t have your own. The “Reach FM Family Fun Day” at Nitehawk Year-Round Adventure Park, Saturday, February 23rd from 11:00am to 5:00pm.